As every year, the last Friday of November is both a happy and a sad day for graduates, lecturers and the WIT team. It is the time to celebrate and the time to say goodbye. And no matter how experienced our graduates are, it is for sure a day that makes everybody emotional and a bit nervous, too. Especially for those who were combining work, family life and studies for at least two years this last step is a great relief. Twenty fresh graduates have joined the alumni family of the Wildau Institute of Technology last Friday. Many of them have attended the ceremony. No matter how tough it was, it was an enriching experience, our graduates say. And this ride would not have been that successful without the support of the lecturers, the team, and, first and foremost, the families and friends. In sum, more than 70 persons have found their way to the Hofsaal of the Technical University Wildau in order to congratulate our – now former – students and celebrate with them. Prof. Dr. Wolfgang Vieweg, the keynote speaker at the graduation, quoted Confucius who once said that if you choose the job you love, you will never have to work again. The studies play a core role for the students in finding out what his or her passion is. Relying on the knowledge that the students have acquired during their studies at the WIT, keeping an eye on future developments and staying curious at all times – these were the most important pieces of advice that Prof. Vieweg shared with the graduates. There is no surprise that Kaja Demuth, our Aviation Management student who graduated with honors, was the one to hold the graduate speech. In her personal and very inspiring talk she pointed out the importance of aviation for international understanding and cooperation. The international character of the industry and its ability to connect people is unique and should encourage every former WIT student to contribute to the global exchange on cultural, industrial and personal level. The most exciting part however was the certificate award ceremony – the reason why everybody attended the event. Prof. Dr. László Ungvári, the President of the Technical University Wildau, handed out the certificates and wished our fresh alumni much success. For some of our students it was just a symbolic act, others came to the realization that they have achieved something very significant just at that moment. The joyful time after the certificates were handed out continued during the graduation party at the Kavalierhäuser in Königs Wusterhausen. 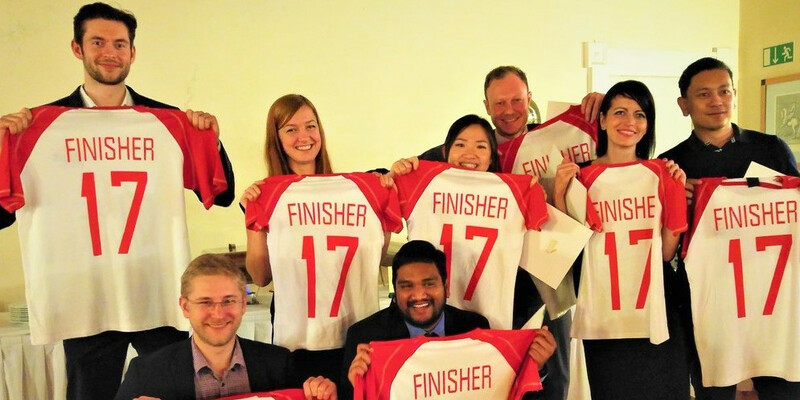 During the festive event our graduates received their presents – a symbolic picture from the kick-off, the first day at the WIT, and a traditional finisher shirt that officially certifies that the student has completed his or her studies at the WIT. Even now, a few days after the graduation, we are already looking forward to seeing our former students again. We wish our students all the best and may your life after the studies be as joyful as the day of your graduation.